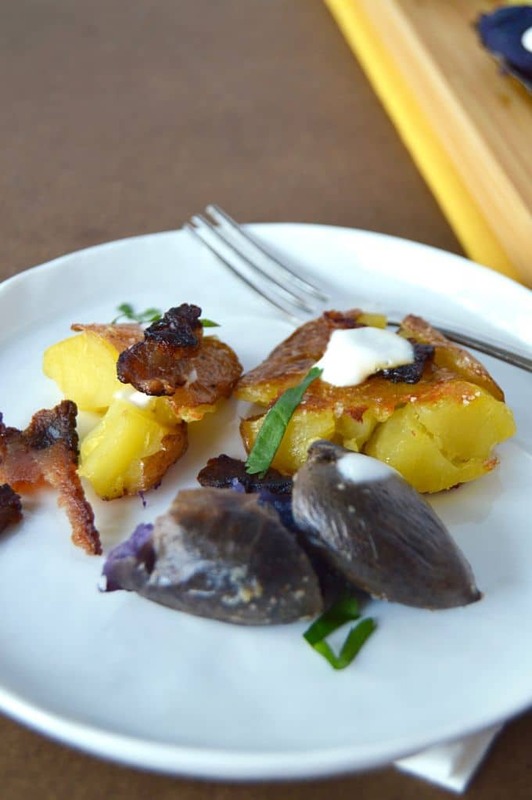 Smashed Potatoes with BBQ Bacon ~ a recipe that hits on all cylinders! 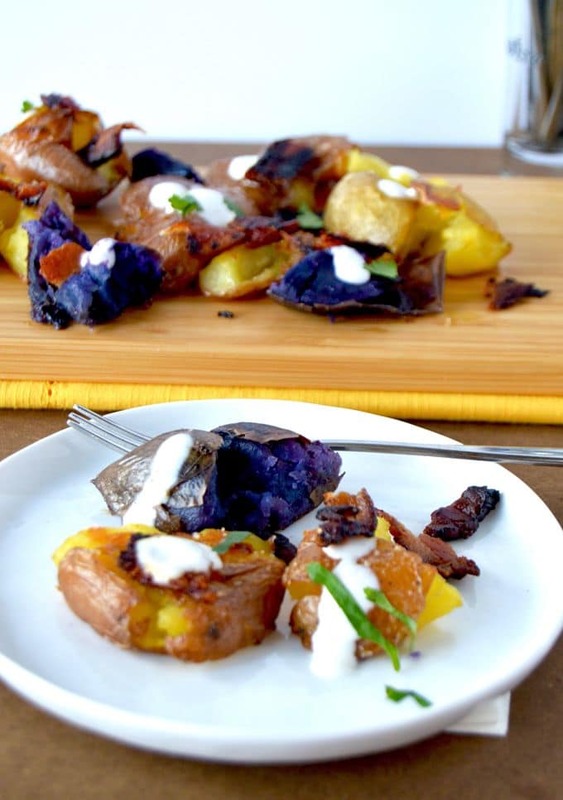 Crispy edged potatoes; sweet and tangy from the bbq sauce brushed bacon! Drizzled with a little cold sour cream for a last burst of flavor! I’ve mostly used them as a side dish before . If I need to they can be prepped early in the day and then just popped in the oven to finish when its go time. When I was looking at my most popular posts one blaring observation is that if they have any potato in them you all LOVE them! Well, who am I to argue as I know ANY potatoes are my FAVORITE things too! I can’t believe I’ve never thought to serve these as an appetizer before? The original Smashed Potatoes recipe just had the roasted potatoes with salt and pepper but it occurred to me for an appetizer I could really amp up the flavor a bit with these Smashed Potatoes with BBQ Bacon! I make a Meatloaf wrapped in bacon brushed with bbq sauce that is a huge crowd pleaser because it’s amped up meatloaf. We were eating the potatoes as a side dish with the meatloaf and a piece of the bacon ended up in the same bite…. I realized right then and there it was a perfect addition so why not do it for the potatoes too! This Simple trick is both a time saver and flavor booster!! We served these Smashed potatoes with BBQ Bacon with these Bloody Mary’s for a get together with rave reviews! Let me know what you think! Place potatoes in a pot of water and turn heat to high. Bring to a boil and cook for 20-25 minutes. Potatoes should be softened, but al dente so that when you smash them they do not disintegrate. While potatoes are boiling you can start the bacon. Brush both sides of bacon with BBQ sauce and place on large metal baking sheet. Place in the oven, turning once and cook until crisp and browned. About 20 minutes. Remove bacon to plate for later use. Leave bacon drippings on baking sheet for added boost of flavor for potatoes. Once potatoes are to done boiling, drain water and let cool for 5-10 minutes. Place potatoes with 2 -3 inches in between them onto the baking sheet. (The bacon drippings will till be on the baking sheet. Using the palm of your hand, press firmly to "smash" (slightly flatten) the potato. Once all potatoes are smashed drizzle olive oil over top of potatoes. Then generously season the potatoes with salt and pepper. Place baking sheet back in oven, baking for 20 or so minutes. Check on the potatoes and flip them at 10 minutes. You will also need to crumble the bacon over the potatoes after you flip them. Potatoes are done when the edges are crisped and golden brown. Taste potatoes and add salt and pepper as needed. Serve immediately will sour cream dolloped over the top or in a bowl for each person to serve themselves. The smaller the potatoes are the better. Larger potatoes will work, but you want the pieces to be bite sized when serving. 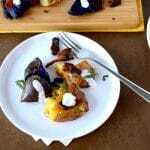 Fingerlings work as well as any tiny potatoes. You can boil potatoes and prepare ahead of time. After boiling, go ahead and slightly smash the potatoes and place in a bowl in the fridge for use when needed. Take potatoes out when you start preparing bacon so they can come closer to room temperature before baking. Smash the potatoes fully on baking sheet after you have browned the BBQ bacon. These work as both a hearty appetizer or as a side dish. « No Fail Rye Flour Pizza Crust! Oh my goodness, these look awesome!! I never thought to smash potatoes like this before! Love the thought of pre boiling and then baking the potatoes in the bacon fat. Will definitely be trying this soon!! These crispy potatoes look like they would be perfect for brunch. Those potatoes look wickedly good. Very tasty. Great side item recipe for any meal! I also love Famous Dave’s sauce! Yum! What a great, easy idea. I’m always on the hunt for new ways to use potatoes! What wonderful comfort food!! It’s on the list for the next rainy day… so probably tomorrow! What a wonderful recipe. I bet it would be great if you used sweet potatoes as well. Yum! Hannah~ Great minds think alike~~~~ I have tried it with sweet potatoes, but decided you had to also have a couple of regular potatoes. The sweet potatoes taste great, but don’t get as crispy as the regular ones. What a great new way to serve potatoes. Gotta try next time guests come over. That looks so delicious! I love different styles of potatoes. Add bacon and you have a winner! I like the idea of smashed potatoes. I usually just whip them. I want to try this out next time I make potatoes! Sincilliya~ Its a variety of potato! Isn’t it colorful. I found these at Trader Joes, but have seen them at many grocery stores and farmers markets. You had me at bacon. Seriously, I’ll eat anything on potatoes. My weakness. These look so good! I have heard about cooking bacon in the oven but never tried it myself. Love the idea of less cleaning! Oh this looks like a great dish! I love the small potatoes smashed like that. The toppings look divine! Oh yum. What a fabulous idea. My girls would go nuts for these. They are the biggest potato heads ever. I will have to try this! I am a veggie but the idea of smashed potatoes sounds nice. What would you add to replace the bacon? Bacon and potatoes are such a winning combination. Crispy, well hello there, winner complete. My husband and daughter would love this. They think bacon is its own food group. Oh how I love smashed potatoes. This sounds so delicious, I am going to have to try it soon! And bacon!!! I will take them extra crispy , thanks!! I really like smashed potatoes. I like the crust you got and how you served them. These smashed potatoes looks good. Will have to switch the bacon to turkey bacon for me. But this is a great idea for an appetizer. Smashed potatoes are so awesome. Your recipe looks gorgeous. They are crunchy and beautiful on the outside and soft on the inside. Just perfect. I just have one problem though. What to pair them with? What do you like having with your smashed potatoes? I have to admit I end up eating them by their lonesome most of the time. Definitely an EXCELLENT idea to cook the potatoes in the same pan as the bacon – yum for extra bacon-y goodness! These look heavenly – definitely going on the “To Make” list! Thanks for sharing! This is kind of like a gourmet adult version of a loaded potato skin, without the thick chewy skin. I wish I would have had this recipe for Superbowl! I love that you incorporate purple potatoes as well. Love them! Yum. This is definitely something I’d keep popping into my mouth Michele. Dangerous. 🙂 And that purple potato… gorgeous! This looks incredible! I can’t resist smashed potatoes!